Pasta with Leeks, Eggs and Bacon, Thyme for Cooking easy gourmet. 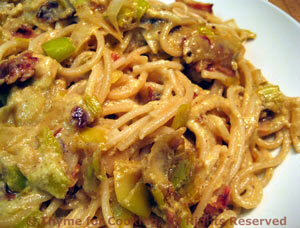 This is my answer to the much more decadent Fettuccini Alfredo and a variation on Spaghetti Carbonara. Leeks are best in this, as they are mild, but you could substitute 2 onions, just sauté them until very tender and starting to brown. Clean leeks and slice 1/4" (.75cm) thick, using up to the dark green. Sauté bacon in a large nonstick skillet until crisp. Remove and set aside. Pour off most of the bacon fat. Add olive oil to skillet and scrape up any brown bits from the bacon. Add leeks and sauté until very tender, about 10 minutes. Crumble bacon and return to pan. Whisk eggs, yogurt and 1/4 cup Parmesan cheese. Drain pasta and quickly add to leeks. Using tongs or 2 large forks, toss lightly to combine. Pour egg mixture over pasta and cook, stirring/tossing constantly, 1 - 2 minutes, until eggs are very, very lightly cooked (they'll finish from the heat of the pasta - if you cook too long the sauce will be crumbly rather than creamy). Immediately pour into a large serving bowl, sprinkle with remaining Parmesan and serve. Note: I used whole wheat pasta.